Susan Royal is with us today sharing her new book, Xander's Tangled Web and she's convinced Xander himself to come along and give us his thoughts on his story. After a late night visit to Battington’s marketplace, Princess Mena has vanished without a trace. Merchants are frantic when King Leander calls for a curfew and postpones the spring festival. Certain former constable Xander is the man for the job, the mayor hires him to investigate, hoping he can solve the mystery in a hurry so things can go back to normal. Xander’s not so sure that’s possible. Romance is involved, and folks who are normally very sensible seem to lose all reason. In addition to sorting out truths, half-truths and outright lies, he must deal with gypsies, an attempted robbery and an incompetent constable before he can solve the mystery. Susan, introduce us to your main character. Thanks, Larynn. 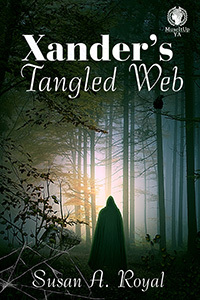 I am interviewing Xander, my main character from Xander’s Tangled Web. He reminds me of Peter Falk’s character in the series Columbo, because while he seems a little simple, he’s really a deep thinker. Tell us a bit about yourself, Xander. Where do you come from? My wife, Suse, and I are both descended from a race of little people called Mipins. She’s a pretty little thing, but I’m not much to look at, that’s for sure. Honestly, I don’t know what she sees in me. I tend to squint a lot when I’m pondering over things and my eyebrows come together. She says it makes me look like there’s a woolly caterpillar crossing my forehead. I grew up in a sleepy little township by the name of Battington. Located in Seren Valley in the Kingdom of Regal, it’s bordered on three sides by the Heliotrope Mountains and to the south by the Azure Sea. It boasts fine buildings of red or blue brick and streets paved with smooth stones and large old willow trees grace the walkways on either side. As pretty as it is, it’s best known for its marketplace. People came from far and wide to shop for the merchandise offered. Sellers of exotic spices and exquisite cloth do business in booths next to apothecaries and goldsmiths. Food courts offer tasty delights like funnel cakes or hot sausage on a stick while actors’ troupes entertain with impromptu performances. I’m a people person, and the people there are warm and friendly. Most of them, anyway. They tend to poke their noses into other people’s business and gossip, but that’s the way of small towns. Not much goes on here, so they have to have something to talk about. For the past year I’ve been trying my hand at farming. Without much success I might add. Before that I was constable for the township of Battington, a job I dearly loved. That is until Cymon, the mayor, and I had some differences which led to a parting of the ways. That’s how I got into farming…and found out it wasn’t for me. I’m fond of ale, particularly the ale at Ardley’s tavern. And it’s a good thing, because the food he offers is enough to turn even the strongest man’s stomach. Then again I’m biased. When it comes to cooking, no one can hold a candle to my Suse. She could boil shoe leather and it would taste like roast. A good thing too. She hasn’t had much to work with lately. I gather you are currently seeking a member of royalty. Aye, I’ve been hired to investigate Princess Mena’s disappearance. She vanished without a trace from the Marketplace a few nights ago. The whole town is in an uproar. King Leander has called for an early curfew and there is talk about postponing the Spring Festival. Battington’s marketplace seems an unlikely place for a princess to be hanging about. What was she doing there? My thoughts exactly. According to everyone I’ve spoken to, she went to see Mercury, the apothecary. And not just for some ordinary, run of the mill spell, either. I’ve been told she wanted a love potion. That complicates things. And if that isn’t enough, the gypsies are back in town. Do you think they have anything to do with her disappearance? When Emil’s bunch is in the vicinity, they tend to get the blame for any sign of trouble. While they’re no doubt responsible for things like freshly baked pies vanishing from the windowsill, a missing chicken or clothing off the line, they’re generally harmless. They are a secretive bunch, though. When you’re not out investigating, what do you like to do to relax? I’ve always loved making rounds, seeing Battington’s streets are safe and secure for its inhabitants. It’s especially nice on a crisp night with the moon shining down out of a clear sky, its light bright enough to cast shadows. Either that or spending time with Suse. That’s when I’m happiest. Like I said, Battington is my home. And I love it here. Guess it’s obvious. Wow! Your adventures sound exciting, Xander. Thank you Susan for bringing Xander along to tell us about your book. raggedy brown homespun who blended with the landscape like a toad on moss. Arms crossed and lips pinched together tightly together, the man stared back at him. Born in west Texas and raised in south Texas, Susan shares a 100-year-old farmhouse in a small east Texas town with a ghost who harmonizes with her son when he plays guitar. She is a mother of three and grandmother of six unique and special children. Her family is rich with characters, both past and present. Susan’s grandmother shared stories of living on a farm in Oklahoma Territory and working as a telephone operator in the early 20th century. She learned all about growing up in the depression from her father and experienced being a teenager during WWII through her mother’s eyes. Thanks for having me today! See you again Friday, 7/27/18 on my blog! It was my pleasure, Susan! I look forward to seeing you again on Friday! Maybe I'm just hungry because the marketplace sounds like somewhere I'd like to spent time! Thanks for stopping by, Ann. A market is one of my favorite places to visit. Maybe that's why I write about them so often! You had me at Peter Falk....I love Colombo! Me too, Linda! All through the story, I kept picturing him with that frown on his face and everyone's surprise when he figured out the mystery!